BURLINGTON, Mass.–Desktop Metal, an emerging startup with a mission to bring metal 3D printing to all design and manufacturing teams, recently announced a Series C investment of $45 million, led by GV (formerly Google Ventures), BMW i Ventures, and Lowe's Ventures. Desktop Metal will use the funding to continue to develop its technology and scale production as the company prepares for its product launch later this year. The company has raised a total of $97 million in equity funding since its founding in October 2015, according to a press release from Desktop Metal. Previous investors include NEA, Kleiner Perkins Caufield & Byers, Lux Capital, GE Ventures, Saudi Aramco, and 3D printing company Stratasys. Driven by invention, Desktop Metal is committed to accelerating the adoption of metal 3D printing in design and manufacturing through the creation of innovative technology that produces complex parts. "Just as plastic 3D printing paved the way for rapid prototyping, metal 3D printing will make a profound impact on the way companies both prototype and mass produce parts across all major industries," said Ric Fulop, CEO and co-founder of Desktop Metal, in the release. "We are fortunate to have the backing of a leading group of strategic investors who support both our vision and our technology, and who are pivotal in propelling our company forward as we prepare for our product introduction in 2017." 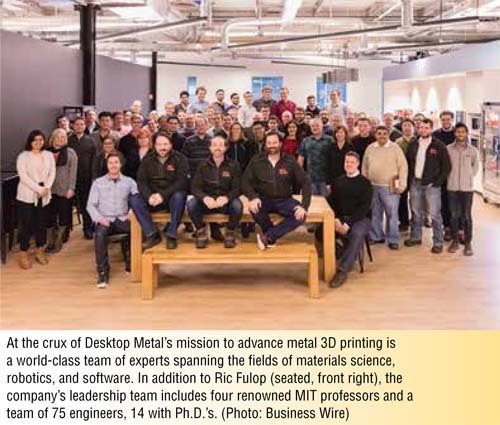 Desktop Metal has amassed a world-class team of experts in the fields of materials science, engineering, and software, including 75 engineers. Leading the company is Fulop, who was the co-founder of A123 Systems and a general partner at North Bridge, an early investor in leading CAD and 3D printing companies, including MarkForged, OnShape, Proto Labs, and SolidWorks. The leadership team also comprises several MIT professors including Ely Sachs, an early pioneer of 3D printing and the inventor of binder jetting; Chris Schuh, chairman of MIT's Materials Science and Engineering Department; and professors Yet Ming Chiang, an expert in materials science, and John Hart, who leads the mechano-synthesis lab. Also on the leadership team are Jonah Myerberg, a leader in materials engineering; Rick Chin, one of the early team members of SolidWorks and previously founder of Xpress 3D (acquired by Stratasys); and Marc Minor, head of marketing of Carbon3D. Scott Crump, the founder of Stratasys, also serves on the board as board observer for Desktop Metal. "Advances in metal 3D printing are driving innovation across a wide range of automotive applications, and we are excited to work with Desktop Metal (www.desktopmetal.com) as part of our vision in adopting additive manufacturing at BMW," said Uwe Higgen, managing partner of BMW i Ventures. "From rapid prototyping and printing exceptional quality parts for end-use production, to freedom of design and mass customization, Desktop Metal is shaping the way cars will be imagined, designed, and manufactured." "The additive manufacturing industry is going through a dynamic evolution, and Desktop Metal is helping to shape that," said Andy Wheeler, general partner at GV. "The company has an impressive product vision, a proven team, and the right level of deep technical experience to bring the promise of metal 3D printing to life."